Summer is filled with many pleasures – warm breezes, sunny days, green grass, colorful flowers, picnics and outdoor parties, and so much more. But summer also brings a few bugs into its long, lazy days. 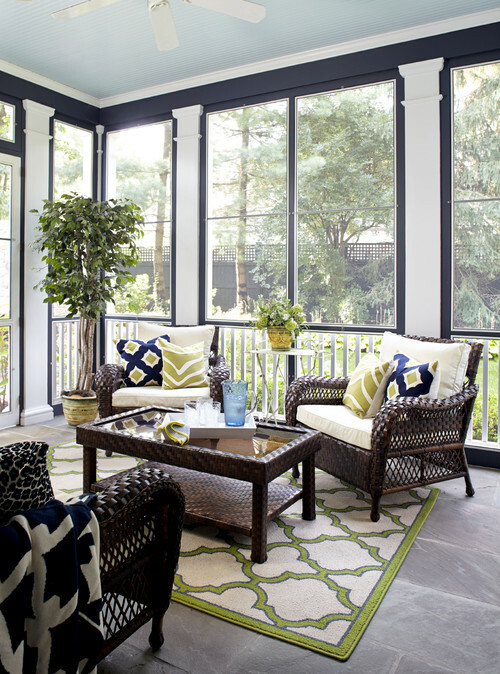 Screened porches create a perfect space for enjoying the outdoors without having to battle the bugs. 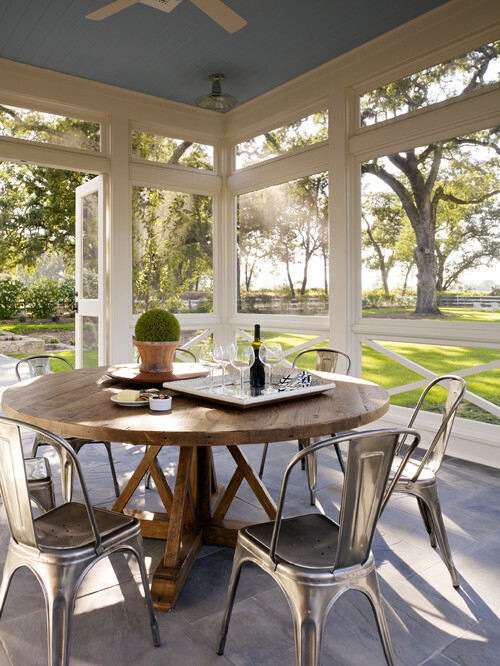 Here are 12 screened porches for enjoying summer fun! 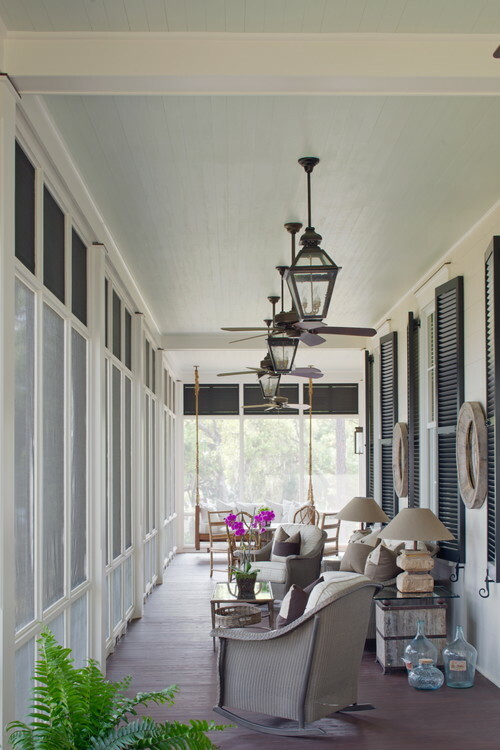 A white-painted screened porch enjoys a container garden filled with native grasses, so you feel like you’re sitting outside. Bright red chairs add a touch of playful color. A ceiling fan makes breezes blow when the air outside is calm. A painted floor is easy to sweep and mop, and flowerpots add bright accents of color. 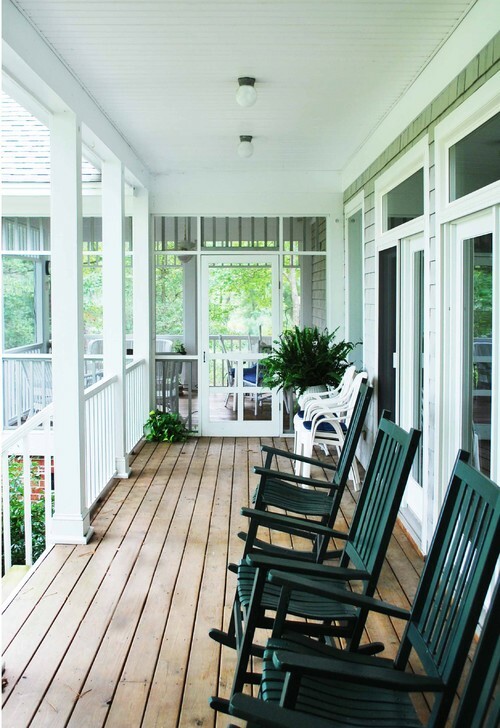 A classic farmhouse porch will always feature a rocking chair or two. This home enjoys both an open-air porch and a screened porch. A simple picnic table provides ample seating for summer family get-togethers. Screened porches allow views to enjoy nature outside, like a serene lake. Screened porches come in a variety of sizes. 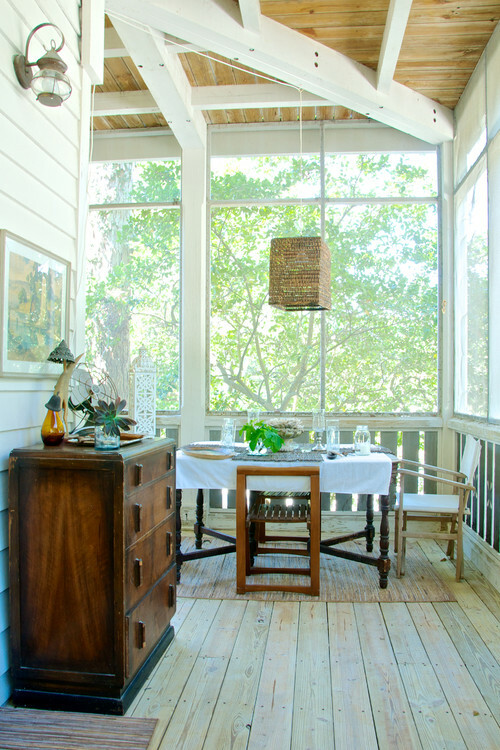 This expansive porch is perfect for outdoor-lovers who can’t get enough of the summer season. 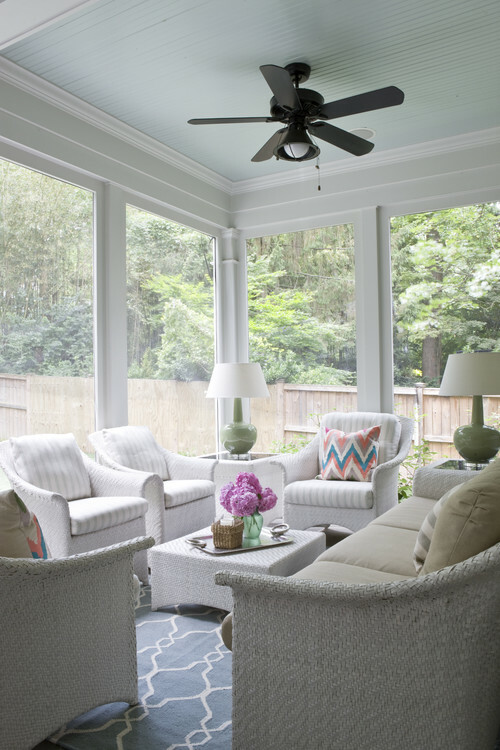 You’ve probably seen haint blue ceilings on front porches, but why not use a cool shade of blue on the ceiling of a screened porch? 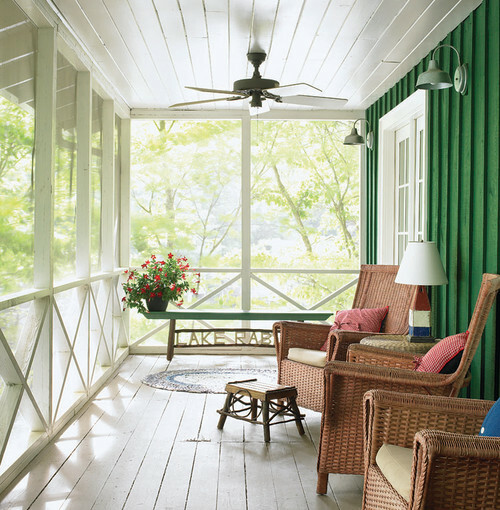 Consider painting the wall of your screened porch a playful green, to mimic all the greenery outdoors. Wicker furniture is a summer staple that provides comfortable and pretty seating. 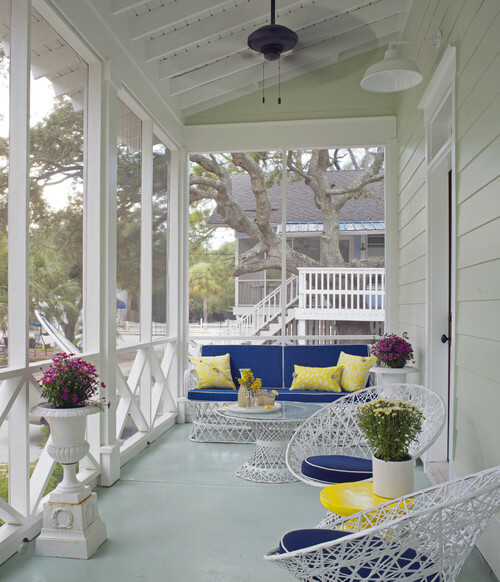 The vibe of this porch says “low country” to me! 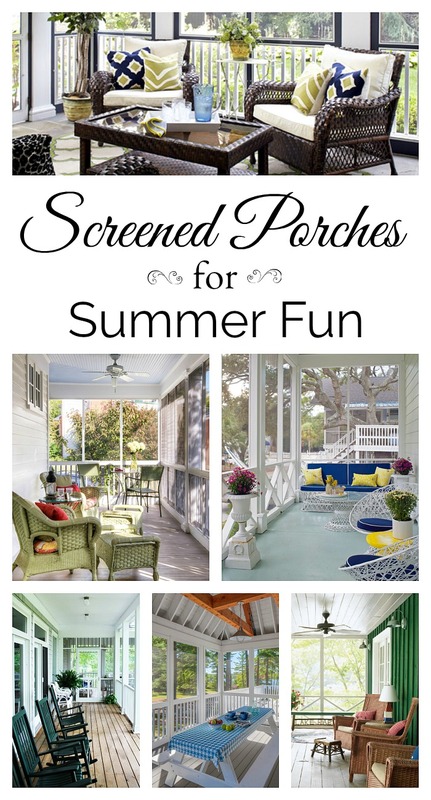 It reminds me of the summer porches we saw every summer when vacationing on Hilton Head Island and exploring the classic southern towns of Beaufort or Savannah. Photo by Atlantic Archives, Inc.
Hubby and I walked past an older home with a screened porch the other day and I suggested the possibility of adding screens to our front porch. Early summer we always enjoy spending time there, but come July and August the mosquitoes can become pesky. We could add a ceiling fan, too. If your porch is deep enough, consider adding some furniture for storage, like this chest of drawers. It could hold serving supplies for meals, or games for entertainment. 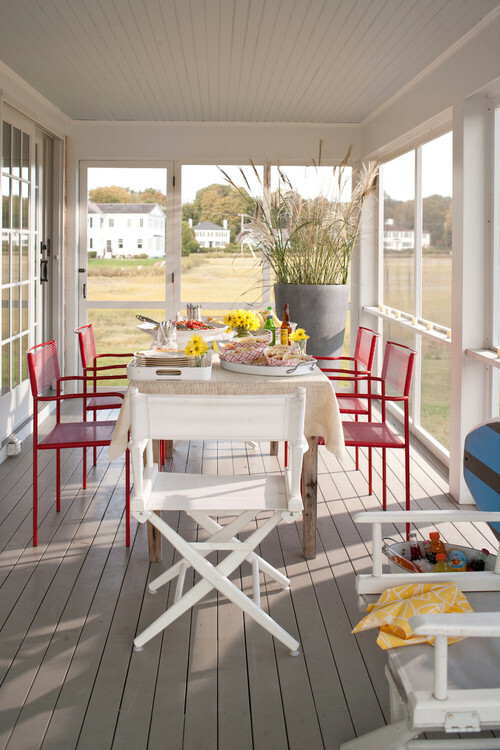 If you’re brave, you might enjoy white wicker furniture on the porch. I say “brave” because I think it would be hard to keep clean with errant dust blowing in. If you have an easy solution for keeping outdoor furniture clean – I’d love to hear it! Consider adding a bit of sophistication with colors that provide high contrast. If you do add a rug, be sure to select a sturdy indoor/outdoor rug that holds up to wear and tear and is easy to clean. I drag my porch rug out to the yard and hose it down from time to time. On occasion I need to scrub it with a little detergent to keep the colors bright. Let it dry out in the sun and it’s good to put back on the porch! 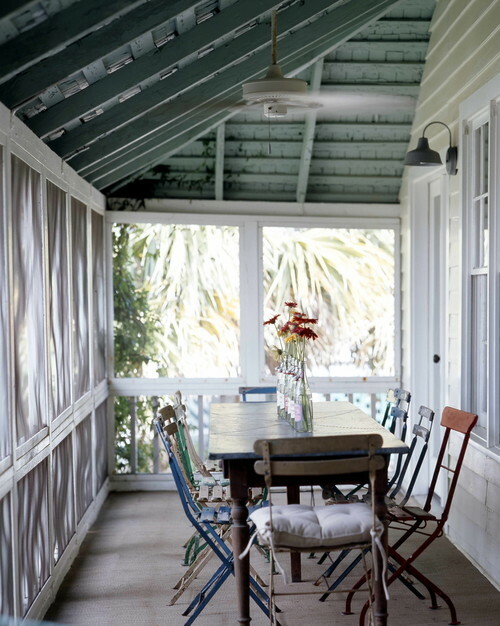 Do you have a screened porch that you enjoy during the warmer months? I’d love to hear how you’ve decorated it or how you use it. Just leave a note in the comments section below! Thanks for sharing such informative article! You can also go to picnics in summer and what’s a better way to enjoy the warm weather than to have a picnic with family and friends. having morning coffee in my favorite rocker. I can not wait to having it finished. I love a screened porch. And I love our Phantom screened porch. The beauty of it is…it raises and lowers so no worry about the screeens tearing in the wind, or getting dusty and dirty w pollen and such. Plus, when there are no bugs…I have a Open air porch. Are u familiar w these??? Love mine. Have had for 11 years and never a problem. They open and close w a remote. Love em. They all look beautiful! I enjoyed looking at them especially as here in the UK we don’t often get weather good enough to sit outside in the evening! I wish porches were more common in the UK, these look fantastic! for the first time in 15 years in our home we finally built a new screen porch. i love the feeling of having an outdoor space that is protected from the elements…and mosquitos. all of these porches are lovely. 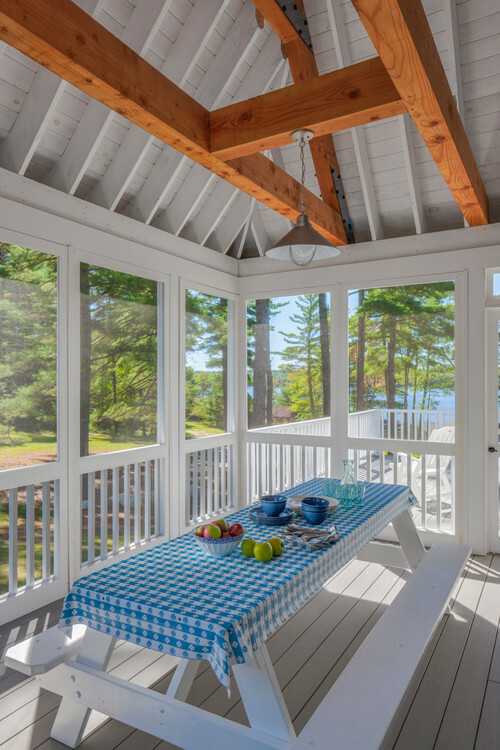 There is nothing like a great screened porch! Beautiful examples! Have a great weekend! 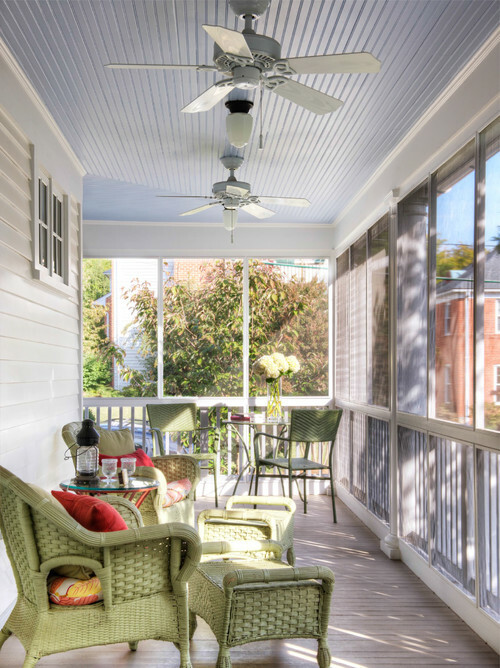 These porches look so beautiful! I was afraid of adding screens to my porch and make it look bad, but these look amazing. I’m totally not afraid of adding screens anymore. Thank you for sharing the ideas! I would love to add a screened in porch to the back of our house. I grew up with one and am drooling over these lovely selections.